The OS65 series has been discontinued. Please see the OS550A Series as a possible alternative or contact our Temperature Engineering department. Non-contact temperature measurement has never been simpler or less expensive. OMEGA’s new OS65 Series of fixed mount infrared radiation thermometers rapidly and accurately measure the temperature of moving, inaccessible or fragile targets. 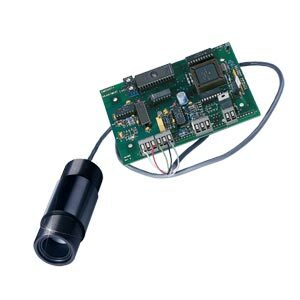 Ideal for OEM applications, OS65-BB Series units include only the infrared sensing head, 15' interconnecting cable and electronics card (no electronics enclosure is supplied). For those applications requiring a complete system, the OS65 Series is also supplied as a complete NEMA-4 system, which includes the infrared sensing head, OS65-RAB mounting bracket, OS65-MN mounting nut, 15 foot interconnecting cable and electronics card housed in a NEMA-4 (IEC529, IP66) enclosure.